Fixed speed signs, an affordable entry level SID system. A value for money solution. If you don't need a speed indication device which displays traffic speeds in real time a fixed message format is a value for money alternative. 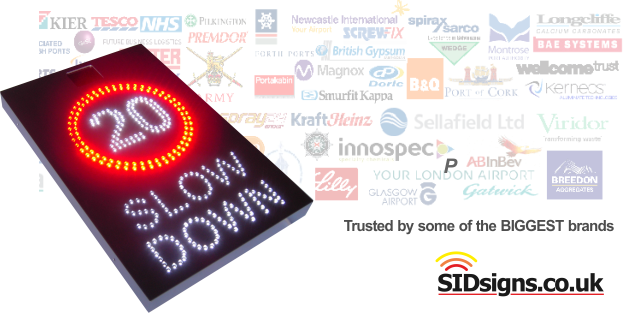 This type of sid sign uses an on board traffic detection radar to monitor approaching traffic. When a vehicle is identified as exceeding your speed limit the detection device turns the led lighting on. This simple but very effective technique provides you with a responsive traffic alert sign which costs less than you might think. From a technical point of view these fixed formats are quite straight forward to produce. A road sign pictorial design is recreated using led lights, a traffic detection radar acts as an ON/ OFF switch. Slow moving traffic results in no action, the led lighting stays OFF. High speed traffic is picked up by the detector, the led lights are turned ON. Obviously it's a bit more complicated with extra components and on board computation but this is the basic concept behind this kind of speed indication device. Although this type of fixed speed sid is simple to produce it doesn't mean the components are any different. The same high quality detection and signal processing parts are fitted inside; they're just not being asked to do anything especially complicated. Simple fixed speed sid signs are great when you just need to get the job "done". If you don't need to see a real time display of speed on the front of your sign a fixed speed system could be the ideal option. Fixed format speed indication devices are priced according to their complexity which means this type of sid display is the best option if you are on a tight budget. Used in areas where the speed limits or other conditions don't change a fixed speed display can be set to trigger at the posted speed plus or minus your desired margin and left to get on with enforcing speed limits. Visibility can be enhanced by setting the display message to flash on & off when the sign is turned on by speeding traffic. The ability to flash the message along with setting the flash rate is all part of our new software control system. These fixed signs have our unique auto detect USB software system as standard. All speed indication devices can be specified with internal data logging capabilities if required. This feature allows you to see a record of the traffic flows and speeds experienced by your fixed speed sign. Stored on a solid state microchip, usage data is split into hourly, daily, weekly and monthly categories for clarity. Data logging is designed to create a record off all vehicles not just those who's speed has triggered the sign to illuminate. Recording all traffic allows you to see at a glance the times when traffic flows are highest, how many drivers are obeying your limit, how many are ignoring it. Retrieving any stored data is made as easy as possible using auto detect USB drive detection and downloading. Simply plug a blank USB drive into your sign and wait while data is downloaded automatically. Affordable fixed message sid displays made from aluminium alloy, fitted with European built K band radar detectors. If you want something which works get what you need without spending more than you want.